All hail the pork belly, a fantastic cut of meat. 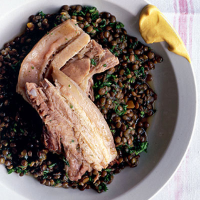 With the rich belly, you will want some quite dour lentils and a dollop of mustard. For the brine, put all the ingredients in a pan with 1 litre water and slowly bring to the boil. Decant into a large, non-reactive container and leave to cool for 1 hour. Submerge the pork belly in the cooled brine and refrigerate for 2–10 days, depending on how long you have. Soak the brined pork in fresh water for 1–2 hours. Put the pork in a very large saucepan with the other ingredients and cover with water. Bring to the boil, skim off any scum and reduce to a very gentle simmer for 3 hours, until the flesh is soft but not collapsing. When the pork has been cooking for 2 hours, start the lentils. Cover the bottom of a largish pan with the olive oil and sweat the chopped vegetables. At the moment they are just starting to soften, add the lentils. Stir all around for 2 minutes, then cover with about 700ml water and nestle in the bundle of thyme and parsley. Simmer, stirring occasionally for about 40 minutes – you want the lentils soft but not squidgy. If they dry out, add a splash of water.Now season them. It is amazing what simple salt and pepper do to the flavour of lentils – they make lentils of them. Just before serving, stir in the chopped curly parsley and a healthy splash of olive oil to enrich the lentils. Take the pork out of its liquor, remove some of the fat and slice. Serve with the lentils. Red wine with an acidic cut will help to slice through the richness of the pork belly here. Push the boat out with a craggy barolo.